Please note that this page contains spoilers for the entire series. So did you watch the Alien 9 / Alien Nine anime and feel totally confused? Did you then read the manga and feel even more confused? Wondering what happened to certain characters? And what was up with that ending eh? Well here I and others attempt to answer all your burning questions regarding the anime, manga and overall series. Please keep in mind however that this site does not have any official affiliation with the developers of this series. Therefore the answers here are simply personal conclusions drawn from studying the series. For the original author's perspective on certain scene and character choices or their reasons for the violent themes then check out the first and second volume of the manga which includes an interview with Hitoshi Tomizawa. If you're interested in buying the books, DVDs, or anything else then you can find some places to purchase them in the Store section. Why is there a 9 in the title for this anime? How many clans are there? What do they look like when they're not symbionts? What do we know about them, really? What happened to Kumi at the end of the Alien Nine anime? Did Kumi die in the Alien Nine: Emultators manga? In some parts of the comic, Kumi's eyes had changed to the cross sign. What does that mean? Is there another person controlling Kasumi? Was the attack on Yuri from the three boys in the alien quarantine organised by Megumi (Teacher)? During the attack on Yuri by the three boys, how is it that Kumi and Kasumi were able to feel what Yuri was feeling at that time? Why did Kumi's eyes become the X's in the AlienNine: Emulators manga? In the AlienNine: Emulators manga, why did Kasumi buy and dunk her head in an entire tankard of milk? In Episode 4 of the anime, when Yuri and Kumi linked back together, why did Kumi get a flashback of her being alone and her mother? At the end of Episode 2 of the anime, Yuri is crying and kills the other borgs and runs to Miyu. The part I don't understand is why she's crying in the first place. A friend of mine said that she was raped or something but that doesn't fit what I saw. So what did happen to Yuri that made her cry all the way to Miyu's legs? Why is Yuri always sad or scared even if she is simply talking to her family or friends? Why did Megumi let Kumi go to work (or looking for aliens) if Kumi's alien is unable to protect her? What type of alien attacked Kumi? Was it a Yellow Knife getting revenge for the other Yellow Knife Kumi tried to kill? The most basic reason is that the characters of Alien 9 attend 9th elementary school . This is probably just like the numbering of districts really. Perhaps a name for the school wasn't important because it was just another number or applicant for the race for the best results. Another potential deeper reason becomes apparent in the 4th and final book, Alien Nine: Emulators. In this we learn more about the borg clan and that there were 9 different generations of borg. The borgs from the series that Yuri and the rest have to work with etc. is the 9th generation of the borg clan. The clans seem to basically be alien races that all have different aims and ways of life, perhaps even different needs. We are told that the Sunflower clan don't care much about the host's survival, whilst the Drill clan are much more careful and seem to depend on the host's survival more. Since it seems that as soon as one alien landed, the rest followed, it seems the alien clans know of each other, especially as two are rivals. This could either be because unlike Earth's people, the aliens can communicate with each other across planets or perhaps they just live with each other on some other planet, and therefore when one discovered Earth, the rest soon found out (or they discovered it by themselves around the same time, it's not said). It's possible more would soon find out too and realise the potential of the planet Earth if more exist. The Drill clan, which Yuri's school is seemingly run by, mentions that they feel that they are the best, and that they must convince the humans not to go with the "others", the principal also mentions that things could get "worse". It seems to be like a race or a competition for survival, and I personally don't think there is a limit to the amount of competitors that will sign up for it but we are not told of the future, as the idea of things getting "worse" may be merely referring to how much more serious the Sunflower's attacks could become rather than the prospect of further invasions. Either way the only limit with Earth itself is probably how many hosts they can nab so other clans looking for an opportunity is a possibility if they exist. I'm not sure I understand the question. Personally I think that the form we see the aliens as before they're completely fused with a human (and aren't visible) is their personal form, although I'm open to the idea that they could of had another form, I don't believe we are given an idea of that unless you can tell me otherwise (I'd love to know if I missed that). I believe I heard that Alien 9's aliens are modelled from aquatic creatures, whilst Hitoshi Tomizawa's other work, Milk Closet, is more modelled around insects. We know that the first alien discovered was in September 2008. There are at least 3 different clans and each of them has different characteristics, personalities and needs or aims. Some clans like the borg clan have gone through different stages of evolution called generations in an effort to adapt and become more efficient survivors. They're likened to aquatic creatures. They like humans as hosts because they produce plenty of energy and electricity. They're also very versatile. It takes at least a year to have a body strong enough to live harmoniously with an alien, the Drill clan seems to use lower alien life forms to test the host and develop them so that they're strong enough to fuse. Since we follow Kumi and the others, if they don't know enough about the aliens themselves I guess we can never either. I think if we knew all about them the series would seem less threatening though, as fear of the unknown can be quite effective, so it's probably on purpose that we can't get a full idea of the aliens, putting us in the same position as the protagonists. This is a question a lot of people probably had after watching the anime. 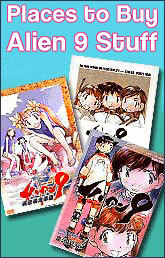 One slightly confusing thing about Alien 9 is that we don't know completely if the anime ending was intended to be a different ending, or not an ending at all and actually a teaser to invite you to continue the story using the manga. Some people might say that the anime and the manga are separate. In that case most would then accept that Kumi died at this stage by committing suicide by roller-skating at a high velocity or something similar, which was my initial thought when I had only watched the anime. Kumi's role did not end at this stage in the story. She was brutally attacked in the library and by normal means she was completely dead. But through alien technology her body was regenerated and brought back to life. She then goes on to save her friends from those that hurt her. Much later in the series it becomes more apparent what exactly was behind the attack. If you were to ask for my personal opinion, I would say that I follow the depiction in the manga. I can understand the idea though that because the anime did adapt on things (such as the addition of depicting all the summer events in full) that it can be thought to be a step aside and seen as a different interpretation (which it is in essence since anime and manga always have differences). But I think, although some scenes were adapted on, it does still follow closely to the manga, and is basically the same story just with a few bonus scenes, which were extensions of existing ones within the manga, and aims to visualise it as it is. So I would say it is only the beginning of the story. They did initially mention they'd like to do more of the anime but plans of this were few and never brought forward. And since its been quite a few years later since it was first released and it is probably quite an alternative/obscure series, I guess it isn't likely as horribly unfortunate as that is. I would of loved to of seen a television series follow the OVA, actually me and the friend who introduced me to this series were expecting one after the abrupt end to the OVA. There was a certain scene (in Alien Nine: Emulators manga) where Kumi was supposedly fusing with Yuri. The events and struggle that unfold resulted in Monami using her borg to cut Kumi from head-down. Is Kumi dead by then? And if she isn't, where is she, as later in the story she had magically re-appeared? Well... Kumi was killed... but everything was still saved in her borg, which was her borg, hence to why Kasumi's borg took the information. Kasumi's borg saved all of Kumi's information, such as memories, feelings, emotions, and then they were able to restore Kumi. If you notice in the other manga, the borg's eyes become X's when they are angered or ready to attack. Kumi fused with her borg, which enabled her to do the same. Is there another person controlling Kasumi? It seems that after the Yellow Knife in Book 2 swallowed Kasumi, she appears to be someone else. Kasumi is fused with a Yellow Knife. She's mostly controlled by that Yellow Knife. In the scene where Yuri was feeding the aliens and clearing stuff in the alien storeroom, the three boys came in to attack her. Was the attack organised by Megumi? In this episode we see the teacher, Megumi, talking to another teacher about the current status of the various schools, their students and how her own students compare. She mentions how she feels about her own students. Kumi and Kasumi, who volunteered to be in their positions, are doing well but Yuri's reluctance, due to being forced into this role, is dragging her record/scores down. From discussing this, Megumi seems depressed at her failings and becomes really determined to win over all other schools, perhaps at any cost as she mentions the need to get even tougher on her students despite the other teacher's mention of her possibly rushing things. She mentions School No.6 and how she wouldn't be able to stand losing to them. Selfishly she looks into getting some more aliens of which the teachers seem to be able to secretly order for the purpose of training students (so that they can get experienced in using and becoming one with their borgs and eventually handle the process of fusing successfully). She can't find any optimal ones and recklessly uses the attack aliens again of which the other teacher said was probably too much (so obviously they must be pretty volatile and stressful for those being attacked). Not only does she use them again, but she also uses all three at once and aimed directly at Yuri. It isn't exactly said that she sends them directly to Yuri but it would seem that it is all set up that way since she is the only one sent out to work and if Kumi and Kasumi hadn't of been so concerned for/close to Yuri at this point, they wouldn't even be there (since the teacher was surprised that they were and possibly just wanted to focus on Yuri that night since she was the only weak link in her plan). She probably thought that she would trigger poor Yuri into becoming more confident by placing her (a) trapped in a corner where she cannot run away, (b) alone so she has no-one to rely on and (c) and forcing her to confront aggressive aliens face-to-face. But this is all too much for her obviously, and it does trigger something... but something of which she can't possibly control as the borg takes over and goes into some kind of instinctive mindless attack mode in response. If you trap an animal in a corner and confront it, often it will be extremely dangerous and will attack blindly in fear. I feel that this is probably what happened... So yes in short I do agree with the notion that the teacher purposefully sent the boys and the aggressive aliens after Yuri. It was already suspicious that the boys had always targeted Yuri when they first appeared (and Yuri herself states that she feels she is being targeted). I think that the teacher was already trying such a trick, but with Kumi and Kasumi around to help Yuri, her tricks weren't working. Or it could just be that the aliens target the weakest first, like packs of animals do with their prey (the youngest, weakest, oldest are often targeted first). But certainly with the way everything was set up in that episode with her being sent out alone, it seems the teacher certainly had influenced the proceedings. And after this scene, she is on the phone to the principal who confirms that she pushed Yuri too far, so I believe that she is responsible. How is it that Kumi and Kasumi were able to feel what Yuri was feeling when attacked by the three boys? It's extremely confusing. Yeah, I found that part to be confusing too, and I think they have been linked together from their borgs. Even though they weren't wearing their borgs at the time, I think it might of have enabled them to sense that emotion. In the AlienNine: Emulators manga, when Kumi saw Yuri together in the company of the boy she was kidnapped with by the earlier generation of the borgs, why did Kumi's eyes become the X's? Kumi did get jealous of the other boy. Or she either felt very protective of Yuri because Yuri is hers in a way. Kumi is very protective of Yuri, so it might be because of her feelings or her protective side kicking in. I think Yuri and the boy didn't really become official, though they were becoming really close. Again in the AlienNine: Emulators manga, why did Kasumi buy a whole pile of milk and dunk her head in an entire tankard of milk? It does seem that later in the manga the Yellow Knife's heightened awareness of others inner minds and feelings is a bit dangerous, kind of like having psychic powers, some things are better left hidden in the mind and the Yellow Knife can go too far. However at this point Kasumi prefers the Yellow Knife as she has a deeper connection with it and it gets rid of her loneliness better than the borg did. It seems the milk is beneficial to her Yellow Knife. It allows her to rid her hair follicles of borg drills, ones that have spread to her eyebrows. Perhaps this is an effort to stop the borg totally taking her over in competition for space on her body. In this episode Yellow Knife (the big amphibian looking thing that dropped onto the school) is attacking everyone in defense of itself through psychological means, using their inner fears. The emotion it takes advantage of is loneliness. This is why Yuri has a dream sequence where she is being left alone by her borg etc. but in reality, Yuri is the only one of the three who doesn't seem to have any issues (that we are told of) with being alone (it seems as if she never lost a loved one unlike Kumi and Kasumi). So she drops out of it and comes crashing back to reality (with a bump..). But is too scared/disturbed to venture further. Kumi meanwhile is someone who has lost her father (he died) and her mother... well it's a complicated issue. Her mother probably would be supportive but Kumi keeps her problems hidden (as we see when she is on the phone to her mother later and simply says "I'm fine" despite her obviously not being fine, she's crying). Her mother, from what we see of her, seems to just sleep or work. Therefore when Yellow Knife mentally attacks her, it brings forth the issue with her parents in her mind, so the image of her mother is shown. Although she has Yuri with her at this point it is maybe not enough to completely cover the loss of a dear parent. Having Yuri and her borg there however does seem to allow her to snap out of it quicker than before. Well at this point in the series, Yuri is showing signs that she wants to try and be more confident. Just as she finally is about to complete a task successfully, all by herself, she is brutally attacked. Now rewind.... because part of understanding this scene means pointing out a scene earlier. Where the teacher was (a) basically noting how she will try anything to beat the other schools (b) ordering those volatile aliens (that the boys wear) which the other teacher told her would be a serious strain on someone and risky. The teacher does this because she wants to force Yuri to be more confident, kind of like when someone has a phobia of cats or something (and they avoid cats) and then someone tries to cure them of that phobia by having them "face their fears" e.g. throwing them in a big pit full of cats! Shock therapy I guess, and something you see often... In this way she hopes to push Yuri into being a more ideal alien catcher and therefore win the school ranks race by having 3 successful students. Back to Yuri... so she's just done her best and completed a task alone despite being terrified. After all that painstaking effort, she is suddenly attacked without warning by the aliens the teacher sent. Yuri, in my opinion, doesn't have time to react. So before she knows it, they've already got their attack shots in. She begins to get flashbacks to words others have said. Words telling her to be strong etc. This makes me think of a lot of scenes in anime and movies in general really, whereby the main character is on the verge of death but suddenly gets some memory of encouraging words and spring back into action. But Alien 9 takes it differently, she hears the words, she knows ideally people would want her to fight, but the terror and the pain are too real and override the comfy words. After this she moves on to Miyu who has always been a great comfort to her. Miyu always seems to try and cheer Yuri up and is generally supportive. Perhaps it also helps that, unlike Kasumi and Kumi, there's nothing 'alien' surrounding her, so it's a less dangerous place to be. Interestingly enough at this point, the uncontrollable borg on her head now falls away, so perhaps that fact supports the notion that once it no longer had 'alien' things surrounding it, it gave up. Yuri is basically distraught and feeling helpless so she goes to Miyu for comfort. Everyone will probably have different interpretations of the same scene, as we all have different perspectives on things. And that is great :) It shows that the series got people thinking and brought them to their own personal conclusions. If you are asking for my personal perspective however, I didn't personally get that impression. I could see the issues with extreme and sudden pressure being but on Yuri to try and get her to 'jump into action' using shock therapy, and her breakdown and the instinctive defensive actions of the borg. But I mainly only look at the attackers as being the aliens. Not the boys. The boys, in my mind, were like drug addicts. They were just there for the thrill (of wearing an alien), which is why whenever their aliens come off they just remain there grinning etc. All they want is their cheap thrill, because to them, everything else is a bore now. Since they had their first 'taste' whilst chasing Yuri earlier (but Kumi and Kasumi were there then). Likewise however, the aliens themselves are only doing what they're instincts tell them to do... they were purposefully put there because they are extremely volatile. The aliens don't decide to attack, it's just their nature. It's kind of like that case I once saw where a guy accidentally put his arm within a tiger's cage and naturally got attacked... The guy said that he did not blame the tiger (he was asked if he wanted the tiger to be put down) because it was simply in its instincts to attack in that kind of situation and that it was his own fault for putting himself there. Well Yuri didn't mean to be in the path of these instinctively dangerous aliens... Her teacher put her there. That is how I saw it, although there are some who really like the teacher and hate to hear that she'd do this, I can sympathise with them, but I guess she is just human and is capable of giving in to selfish tendencies. If we went further up the ladder we could say whoever started the rat race of the schools in the first place were to blame. Since that is what is influencing the teacher. But blame is a little difficult to perfectly place here. It's quite interesting how all the characters have their faults. Why is Yuri always sad or scared even if she is simply talking to her family or friends? (For example Yuri tells her Mom to record a show but she forgets the time and when Yuri tells her the right time she looks scared). I can't remember that scene exactly but I think she was worried she was going to miss her favourite show or something (she probably didn't trust that she'd remember, if she forgot it once she could do it again). So she looked worried but with Yuri she wears her heart on her sleeve and her emotions are never in small doses. If she's in a dangerous situation she's not just nervous, she's absolutely terrified. And if she's in a good situation, she's not just happy, she's blissfully overjoyed. She's just very emotional really. This acts as a complete and stark contrast to the other two characters. Kumi is very defensive regarding emotion and Kasumi at times seems devoid of true emotion. I feel that this demonstrates their different upbringings and current family relationships. Both Kumi and Kasumi were forced to grow up very fast and take on a lot of emotional responsibility at an early age due to losses in their life (Kumi lost her Dad and Kasumi lost her brother). They feel that they need to hide their emotions. Kasumi just wants everyone to be happy so she pretends that losing her brother didn't tear her apart and simply smiles and "nyas", whatever happens. Kumi has to look after her mother a lot it seems and when she's on the phone crying she doesn't seem to want to explain, she wants to hide her emotions and simply says "Everything is fine". But Yuri doesn't seem to of lost anyone, you don't see her Dad but he's just busy working a lot and it doesn't seem to be given much attention, unlike the others. She hasn't been forced to grow up and bear the burden of adult responsibilities yet. Which is also shown when Megumi visits each of their homes and Kumi and Kasumi are quite restrained and seem forced or encouraged to work very hard one way or another, but Yuri has her kids toys and so on :) Either way, Yuri is very open and honest with her emotions. At first this annoys Kumi but eventually she comes to understand her fears and experience them for herself. So then rather than assume she is whining over nothing and be dismissive, she comes to accept and offer support. Why did Megumi let Kumi go to work ( or looking for aliens) if Kumi's alien is unable to protect her? Well this is where the manga and the anime appears different but since the anime ended at such an ambiguous point it can't be said if the director for the anime was going to take it in some kind of different direction to the manga. In the manga, Kumi is wearing her borg when attacked. In the anime she isn't. I don't know if Kumi is necessarily on full duty in the anime at that point, in the manga she is in the library because she's nervous about Kasumi being a fake or an impostor after her alien encounter with a Yellow Knife. Kumi appears to go to the library to find out more about aliens (but there's no information available), so she's not particularly looking for actual aliens although she is in uniform. But you know, it's a very interesting point because in the manga Megumi has to use the borg to find out what happened... Unless she can still use the borg somehow to find out what happened regardless of if it was present or not, it does appear then that the director was planning on a different path to the manga, similar to how he added to the manga by elaborating on their summer trip. Perhaps he would of dragged out the whole mystery for a while longer rather than just using the borg to replay the scene. What type of alien killed Kumi? Was it a Yellow Knife getting revenge for the other Yellow Knife Kumi try to kill? It's revealed in the 4th book that an earlier generation of borg killed Kumi. The 8th generation to be specific, which is the generation just before the current borgs that the Alien Party wear. Earlier generations of borgs become 'obselete' and therefore are jealous of newer generations. It may be that this borg also set loose some type of alien called Lynax that have the appearance of eyeballs and these also attacked Kumi in mass and broke through her borg's defences. It doesn't appear that the aliens are related to the Yellow Knife. It's implied however that the Yellow Knife alien was purposefully sent by another to mess things up. The Yellow Knife itself in the anime states that it didn't intend to be there. And when the Yellow Knife creature tries to weaken those around it I think it's just an instinctive defence reaction but it's not very clear exactly its intentions. Megumi, the teacher, in the manga states that the Lynax and Yellow Knife weren't part of the plan and vows that whoever is doing all that can't be allowed to get away with it. Who mighr be plotting against them is up for debate but the final book, Alien Nine: Emulators, goes some way to helping this mystery. I recommend checking out the manga as it clears up a lot of things.